The staple of the Avene skincare collection, the Avene Thermale Spring Water Spray provides essential care for all skin types. Its unique composition is especially soothing for sensitive, hypersensitive, allergic and irritated skin. The pH of the water is close to neutral, and is bacteriologically pure. The low mineral content contains indispensable trace elements as well as silica, which leaves a soothing barrier over the skin. 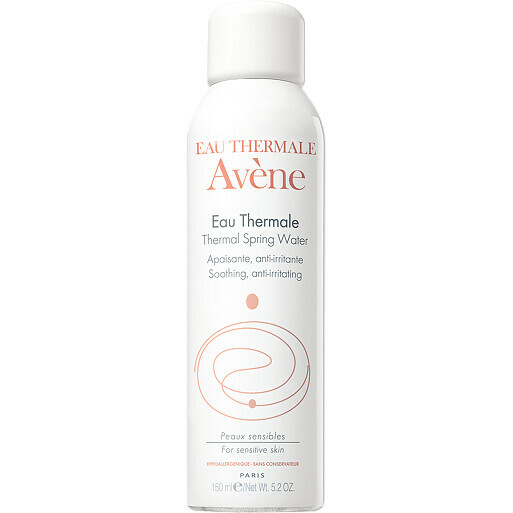 The Avene Thermal Spring Water Spray can be used by all the family, and offers relief from nappy rash, bites and other skin irritations. It’s refreshing action makes the spray an ideal addition to your usual your cleansing routine, a great setting agent for your make-up, and an intensely cooling and soothing skin spritz when out and about. To use, spray onto the skin in a fine mist, wait for a few seconds, then gently pat dry. Avene Thermale Spring Water Spray is rated 4.7 out of 5 by 164. Rated 5 out of 5 by MBart from Buy this now A sensitive skin hero to be used every morning and night. I use it after i've had tap water on my face to undo and remove impurities - especially when i'm abroad and sometimes my skin isn't used to/reacts to the varying mineral levels in different water. Also fabulous for refreshing your face throughout the day. Rated 5 out of 5 by DaisySummers from Makes my skin feel pampered I haven't used an after-moisturiser and/or make-up spray in years. Mainly because my over-sensitive skin has always reacted badly .... lumps, bumps, spots, rashes! This water spray, however, is just fabulous. I spray it over my make-up and gently sponge it in. It has such a great moisturising almost blurring ability. I'm so pleased that I took the courage to give it a go and will now be using it always. Rated 5 out of 5 by Ronika from ESSENTIAL PRODUCT I use this thermal water everyday for various purposes. At any time, it provides the skin with freshness and minimizes irritation. It 's wonderful!!! Rated 5 out of 5 by Jackie31 from Does what it claims to I have repurchased this about six times now, I just love it. I don't always use it every day but I feel uncomfortable if I don't have any in the bathroom just in case. It really is the best thing for sensitive skin. It is so soothing if your skin is uncomfortable. It can't get rid of chronic redness completely but it's a massive help for any redness caused by irritation. If I'm using a hyaluronic acid serum I use this with it and that also leaves my skin feeling really good. I've tried a lot of very expensive facial sprays and none are as effective as this.